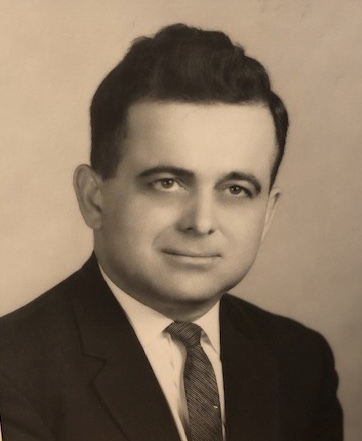 Domenick P. Colangelo, 97, passed away peacefully at his home in Boonton on February 9, 2019. Domenick, along with his wife Marie, were natives of Port Chester, NY where they lived until relocating to Florham Park, NJ in 1962. A proud veteran of WWII, Domenick served under General George Patton and fought in the Battle of the Bulge. After his military service and with the assistance of the GI Bill of Rights, he worked his way through Pace University, earning an accounting degree. He began working for Foster Wheeler Corporation and rose to the position of Controller and Financial Vice President before his retirement in 1983. An avid albeit challenged golfer, Domenick also enjoyed baseball and other sports, but particularly loved being with and around his family. Beloved husband of over 70 years to Marie (LaRosa) Colangelo. He leaves behind his devoted children: Joan Praiss, her husband Tom, NY St. Sup. Ct. Justice John P. Colangelo, his wife Andrea, Janis Hoehn, her husband Michael, Ruth Anne Seifert and her husband Doug. Cherished grandfather of Cristine Hild, her husband Michael, Michael Hoehn, his wife Natasha, Nichole Seifert, Scott Seifert, and John Michael Colangelo. Proud Great-grandfather of Collin, Ethan and Brennan Hild. Dear brother of Beatrice Rende.